Tomorrow ultimately attracted the interest of the new head of a major motion picture studio. In attempting to woo potential producers of my sci-fi screenplay, Tomorrow, I put together a mock catalog of ideas for merchandise inspired by the film. 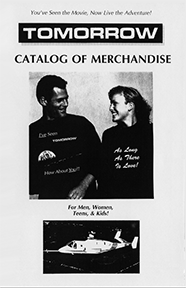 Click here to open PDF copy of Catalog.